Arrange the beetroot on a baking sheet. Season with salt, drizzle oil over and sprinkle thyme on top. Bake until soft. Allow to cool slightly then remove the skins. Cut the flesh into pieces. all the ingredients and pour over the warm beetroot. Allow to cool. Arrange the spinach on a platter and arrange the beetroot on top. 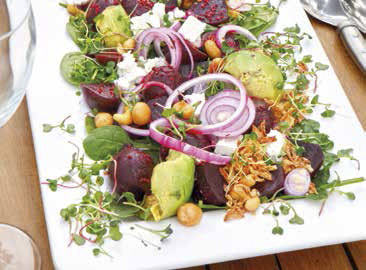 Add the onion rings, avocado and feta and sprinkle with nuts, onion flakes and micro herbs on top. Victoria Lesau – Vroue plaaswerker van die jaar!